George Clooney is firing on all cylinders in Alexander Payne‘s The Descendants. He’s as funny as he’s ever been, but in a different way — previously, his most obvious comedic efforts (O Brother, Where Art Thou?, Burn After Reading) have hinged on overtly deranged personalities, whereas here, he’s funny in a stripped-down, everyday manner. He’s funny because he’s got more weight on his shoulders than anyone else on his particular island of Hawaii, and the person he turns to for advice is his fresh-out-of-boarding-school, 17-year-old daughter Alexandra (Shailene Woodley). He’s funny because he’s in over his head. And he’s as raw and moving as we’ve ever seen him for many of the same reasons. His character is Matt King. He has a successful law practice, but, at the moment, he’s more concerned with the large plot of ancestral Hawaiian property that he’s inherited, the financial future of which lies solely in his hands. On top of that, his wife, Elizabeth (Patricia Hastie), is in a coma after suffering a severe boating accident. This leaves him shaken, uncomfortable, and forced to govern his two daughters, Alexandra and Scottie (Amara Miller), on his own. He’s as clueless as any normal father would be. And then things just keep getting worse. Matt finds out from Alexandra that his wife had been cheating on him with some scrub, and when Matt confronts his most intimate neighbors on the topic, they’re peculiarly defensive of Elizabeth. Everyone seems to be working against him — even Elizabeth’s father (Robert Forster), who, unbeknownst to Elizabeth’s infidelity, criticizes Matt’s own loyalty as a father and a husband in some of the film’s most grueling moments. It’s here, I think, where The Descendants finds a leg up on most of Payne’s nevertheless fantastic previous work. It’s not just the maturity of the film — the fact that it’s dealing with grave subject matter. It’s that the humor and the hurt of Payne’s brilliant screenplay — co-written by Nat Faxon and Jim Rash — are often inseparable. I recall watching Sideways recently — and loving it, obviously — but also being aware of the obvious distinction between comedy and drama. In general, there were serious scenes, and there were funny scenes, and that was that. In The Descendants, however, these two sensibilities are so constantly intertwined that the penultimate effect is startling. You’ll laugh at a joke, and it’ll take you a few seconds to realize what a painful laugh that was. One example: Sid (Nick Krause), Alexandra’s dimwitted boyfriend, laughs mercilessly and ignorantly at an older woman with Alzheimer’s. How sad, how true, and how funny, if only for one microscopically wrenching moment. As far as I’m concerned, for a film like this, that’s the real deal. That Clooney is able to channel all of this so effortlessly is a marvel. He’s deserving of a Best Actor Oscar that he may or may not get. Either way, the most important thing is that he’s working in service of, and often elevating, an enlightening film. He never steps outside of the film for a look-at-me moment, and the result is a portrayal that’s as authentically grounded as possible from a movie-star of Clooney‘s magnitude. The first time you see him on-screen here, you’ll probably laugh at his baggy Hawaiian attire — but by the end of the movie, you’ll be legitimately floored by the emotional layers he unveils. Everyone around Clooney, too, puts forth unquestionably good work. As the eldest daughter, Woodley is flawless, and should be a lock for a Best Supporting Actress nomination. She plays the role of the rebellious, outspoken teenager with such firm resolve that you buy every candid minute of the performance. What she brings out in Clooney, and vice versa, consistently amplifies the material. Also giving stand-out work in the supporting cast are Matthew Lillard as Brian Speer, the object of Elizabeth’s affair; a revelatory Judy Greer as Speer’s wife; and Beau Bridges as the most plain-spoken of Matt’s extensive batch of cousins. Another sign of the film’s excellence is that it manages to surprise each and every scene while also maintaining a mostly conventional overall arc. That’s because the characters are drawn with such unique complexity — and the performances rendered with equal sophistication — that you never really know how they’re going to act or react in a given situation. While it may be easy to foreshadow some of the story’s larger developments, predicting the moments of pinpoint intimacy with a similar accuracy is a nearly inconceivable task. This ensemble keeps you on your toes, and for good reason — they’re playing individuals, not types. 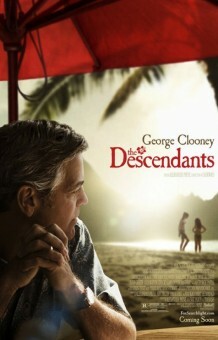 The Descendants is now in limited release in New York and Los Angeles. It will expand on Friday and one can find specific release information, click here.